The largest earthquake ever known to occur in the continental United States struck at approximately 9 p.m. on January 26, 1700. Around magnitude 9, the megathrust Cascadia earthquake rocked the Cascadia Subduction Zone, which encompasses a 600 mile long swath of coast from Vancouver, BC to Northern California. During the five minute long earthquake the shores lurched 50 to 60 feet westward, reshaping the coast and possibly triggering the Bonneville Slide. One thing we know with more certainty is that the earthquake triggered a huge tsunami, which in addition to slamming the coast, also traveled across the ocean and devastated the Pacific coast of Japan. Evidence of the January 26, 1700 date includes the oral tradition of the Native Americans who lived in the earthquake area, studies of tree rings, and most importantly for pinpointing the date, written records from Japan of the tsunami’s impact. 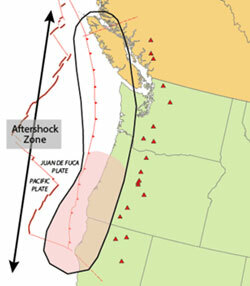 Perhaps coincidentally (or not) today is the Great British Columbia Shakeout (a province-wide earthquake drill).